I’ll be the first to admit that I didn’t jump on the bandwagon of using Pinterest for my business. Yes, I used it for personal stuff like recipes and DIY crafts, but it wasn’t until recently that I started using it to generate leads for my online business too. A recent study shows that the average order from a lead on Pinterest is the highest among the other social media platforms like Twitter and Facebook. 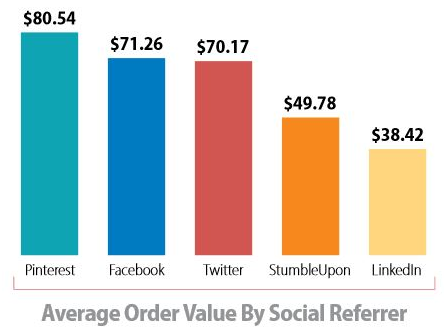 In fact, the order value from each conversion topped out at around $80 from Pinterest. It makes sense though, because when people are looking at Pinterest they are often in buying mode. They’re looking for finishes to update their kitchen, inspiration ideas for an upcoming wedding, the right kind of decorations for a birthday party. I’d say that’s enough proof for us to give Pinterest another chance. Below are seven ways you can create a flood of new clients and set your business apart from the competition. Getting inside the mind of your clients can give you a huge leg-up on the competition. A small detail or common interest that you share can make it an easy decision for someone to hire you. Based on your interactions with your target market you can create a secret Pinterest board of things you’ve learned or ideas/products that your potential client has mentioned. Then you can refer to this board anytime you’re about to jump on a call with them, to get a quick refresher of what they’re looking for. Since Pinterest is an image-driven social network it a no-brainer for displaying your portfolio and set yourself apart from the vast amount of other portfolios out there. Too many portfolios are one-dimensional or are too traditional (aka boring). But with a Pinterest board it’s a much more interactive platform that makes it easy for potential clients to click on an image and see the live URL to your work. 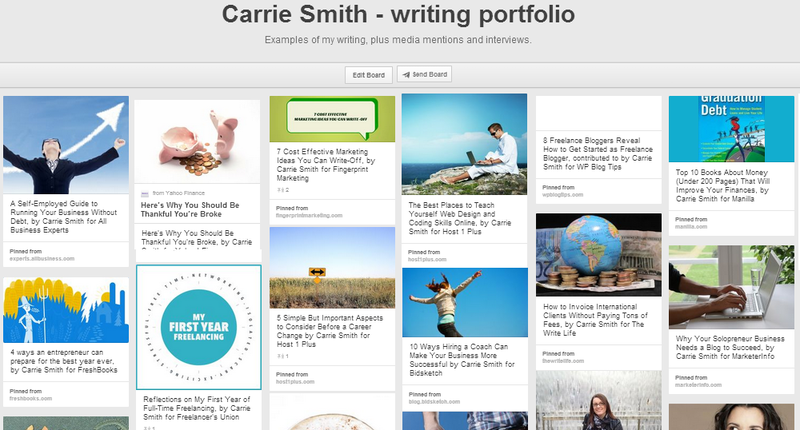 A couple months ago, I started using Pinterest for my own writing portfolio, and have since added links to high-profile interviews and media mentions in magazines. Where else do you have the opportunity to display your credentials in such great color? To-date, I’ve had multiple leads through this Pinterest board, and have landed 4 new interviews and 2 new clients because of it. This is something Bidsketch does very well themselves. They offer an excellent freebie called, 16 Marketing Tactics to Get More Clients, which is not only helpful to readers but it encourages potential clients to sign-up and learn more about what Bidsketch has to offer. 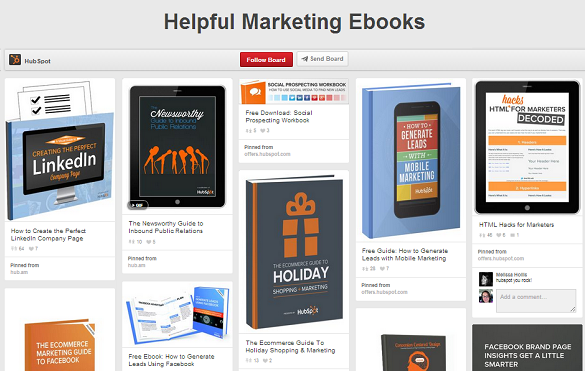 An example of using this on Pinterest comes from Hubspot, a marketing company that releases helpful marketing and social media ebooks to encourage more signups and leads. 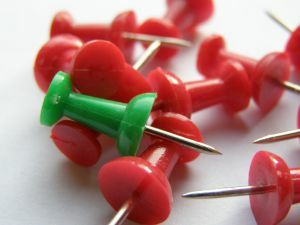 If you have some low-cost products, or freebies that you can offer to your clients, uploading them onto a Pinterest board can drive more traffic and generate more leads for your business. 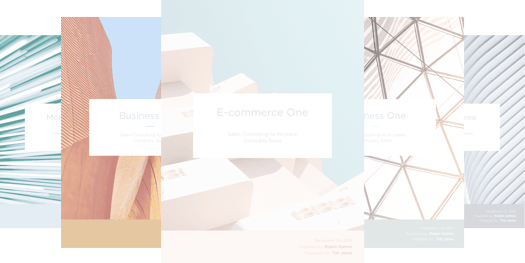 If you don’t have time to create more in-depth ebooks and freebies to generate leads, consider creating 1-2 page checklists or cheat sheets for your clients to download. Visual aids can be a nice bonus that will put your services above what everyone else is doing. It’s all about going that extra 15% for your client, which often means they will easily pay what you’re worth, and more. This is something that The Write Life did for their audience of writers and editors. 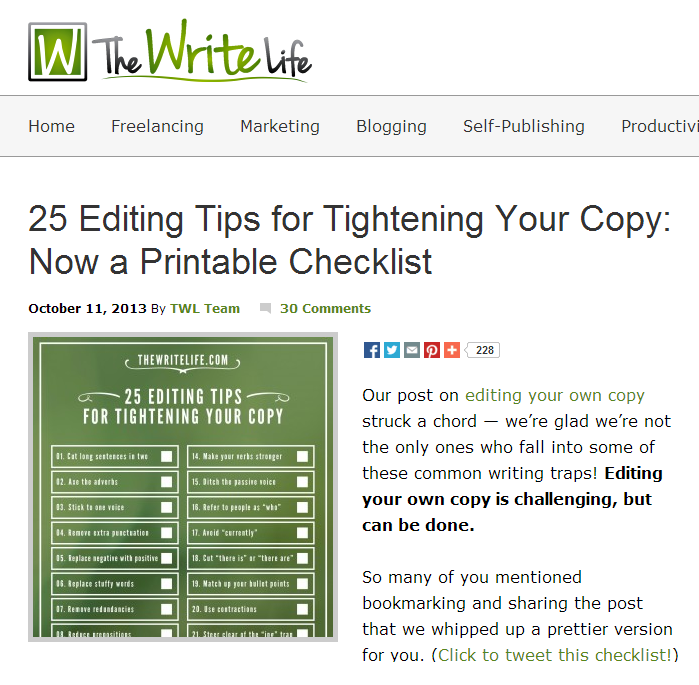 They created a simple 25 point editing checklist, that has been shared hundreds of times on Pinterest. This resource is valuable to their community and helps them stand out in a crowded online space. What does your service provide? What problem are you fixing for your clients? Use a Pinterest board to sell the lifestyle and benefits that your services offer. Images can evoke a feeling, an emotion and even a memory. If you can make that personal connection to a client, they will likely become a fan — and client — for life. We all know how frustrating it can be to understand what a client is trying to say, or what their vision is for a certain project. A secret Pinterest board (or even a public one) takes the back-and-forth headache out of the equation. This is especially helpful for any branding, marketing or design work you’re doing for clients. For example, Milk ‘n’ Two Sugars worked with a web designer who recommended the creation of a “mood board” on Pinterest to learn more about her brand. You can learn a lot about how she wants her brand perceived from her board, and the kind of mood she wanted to create for the site. There’s a lot of color, texture and a feeling of whimsical femininity. Essentially, it’s a whole lot easier to show someone your idea than to explain it with words. You can also use the pin description area and comments to keep notes and interact with your client throughout the project. Nothing shows more proof of how effective your services are than a personal testimony from a previous or current client. Displaying them on Pinterest is an excellent medium since you can display everything from videos, to audio testimonials. We all know that a picture is worth a thousand words, so if you can get your clients to share their experience via video, or even a picture of themselves to go along with the testimonial, your service will essentially sell themselves. Take this example of a Yoga academy who shares the testimonials and experiences of their students. By using these tips and learning how to properly leverage Pinterest, your services can stand out above all the other mediocre entrepreneurs out there. This is especially important if your business is based on imagery and visuals. Don’t miss out the next time you have a lead from a client. Be sure you’re prepared to handle the influx of new clients who want to hire you.